I've got an itch for another shaft. My go-to shaft has been an R flex Kai'li (real) and would like something similar in say Fujikura or another in that class of manufacturers. I'm 62 and my swingpeed in down into the mid-low90's. Any ideas? Newer titleist 917 stock diatrite? Was good. Im 58..mid 90s mph but smooth . Blueboard was my shaft of choice in my younger days. During that time though, I tried a Red as I was starting to "lose it". Thanks for reminding me. I've also read on Golf Shaft Review that the Fubuki J was Russ's shaft of choice a couple of years ago and he and I have similar swing characteristics now. IRC, the Evolution came in the XR I have but in R flex. A little too "R-y" for me. Try an Evenflow Blue in 5.5. I have a Kai'li in my 3w. I've found that tensei blue is fairly close but maybe a little more tip-active. 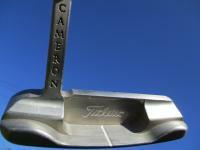 Another shaft I use that I get along with well is Aldila Tour Blue. They can be had on eBay brand new for like $40 and perform well.